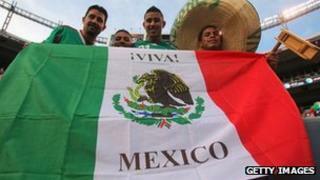 Mexican President Felipe Calderon has sent a bill to congress to change the official name of the country. The current name, the United Mexican States, was adopted in 1824 and was intended to emulate its northern neighbour. President Calderon wants to change it to just Mexico, as the country is known the world over. Mr Calderon, who leaves office on 1 December, said Mexico no longer needed to copy any foreign power. "The name of our country no longer needs to emulate that of other nations," Mr Calderon told a news conference. "Forgive me for the expression, but Mexico's name is Mexico." The name United Mexican States (Estados Unidos Mexicanos) was brought in after independence from Spain. It is used mostly on official documents, money and other government material. Mr Calderon first suggested the name change as a congressman in 2003, but the bill did not make it to a vote. The BBC's Will Grant in Mexico says if the reaction on Twitter is anything to go by few Mexicans see this as a serious issue. Suggestions flooded in for a new name for Mexico, many of them mocking Mr Calderon, such as "Fraud-land" in reference to widespread corruption, our correspondent says. The constitutional reform Mr Calderon proposes needs to be approved by both houses of Congress and a majority of Mexico's 31 state legislatures. Coming with just a week to go before Mr Calderon leaves office, the president's critics see this as a symbolic gesture. Mr Calderon will hand over to president-elect Enrique Pena Nieto of the Institutional Revolutionary Party.